ImagePilot® Aero for Orthopedic Clinics | Konica Minolta Healthcare Americas, Inc.
ImagePilot® Aero for Orthopedic Clinics is a simple and trouble free wireless DR solution that provides the performance and exam flexibility required by busy orthopedic clinics. 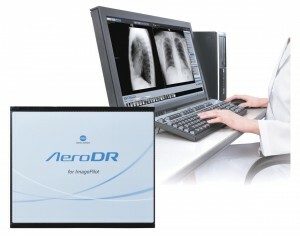 Only ImagePilot Aero for Orthopedic Clinics combines advanced orthopedic imaging, scalable workflow, and the lightest, most durable AeroDR panel with five-year Total Cost of Ownership plans for a truly financially intelligent solution. ImagePilot Aero for Orthopedic Clinics includes a lightweight (5.7 lbs. 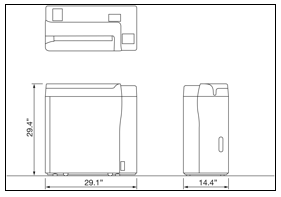 ), 14” x 17” wireless flat panel detector with convenient grip strips that make it simple to maneuver through diverse exams—from bucky to table to wall stand. Single click automatic image processing coupled with easy-to-use advanced orthopedic toolsets further enhance your clinical confidence. AeroSync automatic X-ray detection or a simple hand switch connection enables easy integration with most X-ray systems. Also, ImagePilot’s all-in-one scalability and workflow options let you increase functionality as your needs evolve—so you can meet your imaging needs today while allowing for future growth. 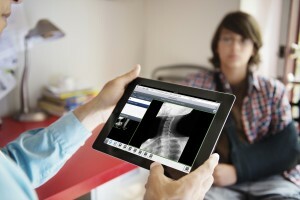 ImagePilot Aero for Orthopedic Clinics adapts to many different workflow scenarios--from a complete acquisition and storage solution to seamless connectivity with external PACS. Easily view and share images from any room in the clinic with the ImagePilot zero footprint viewer on an iPad. The ImagePilot Aero for Orthopedic Clinics includes our strongest, most resilient flat panel detector available today that can hold up to 300 kg (660 lb.) distributed across the panel—so you can image all your patients trouble free. Drop tolerant construction and a long life rapid charge power cell assure greater uptime that helps keep your imaging services up and running despite unforeseen events. AutoPilot, single click, automatic image processing consistently delivers excellent image quality regardless of user experience. Advanced tools are available for additional diagnostic capabilities. Konica Minolta’s intuitive user interface design streamlines the imaging process for efficient, productive exams so you can minimize wait times and maximize patient satisfaction. System reliability is supported by Konica Minolta services that include parts coverage, software upgrades, virus protection, and the optional Informity® cloud-based disaster recovery solution. Grow your practice with ImagePilot Aero for Orthopedic Clinics and realize a better return on investment through improved patient care and reimbursable imaging capacity without replacing your existing X-ray equipment. Less waiting, more doing. Wireless DR workflow helps improve staff productivity and provides immediate results with a three-second preview and nine-second cycle time. Experience fewer delays and virtually eliminate unplanned downtime thanks to the durable AeroDR for ImagePilot flat panel detector. Manage your ongoing costs with a five year Total Cost of Ownership (TCO) program that reduces workflow interruptions and mitigates catastrophic events by covering hardware and software and protecting patient data with Informity, Konica Minolta’s cloud based automatic backup service. TCO service plans help you manage ongoing costs throughout the product lifecycle while protecting against unexpected events. Achieve greater diagnostic capability from your investment. Only Konica Minolta offers such a wide range of integrated orthopedic toolsets. Tools include: spinal (Meyerding, Sagittal Diameters, and Cobb angles); hip (Sharp angle, acetabular head index [AHI], and CE Angle); shoulder and leg (femorotibial angle, descending ratio of humeral head, and CABA angle); and foot (Hallux Valgus angle, Bohler angle, and talocalcaneal angle). Long length imaging options are available for scoliosis assessment and full leg imaging—from manual, multi-exposure DR stitching to CR augmented, automatic, single exposure stitching. Microsoft Windows XP Pro and Microsoft Internet Explorer version 6.0 or higher. Color Monitor with at-least 1280 x 1024 screen resolution. The features included depend on the license(s) purchased and how the ImagePilot is configured.